Due to innovations in astronomy, astronomers now have, in their hands, a valuable piece of information. 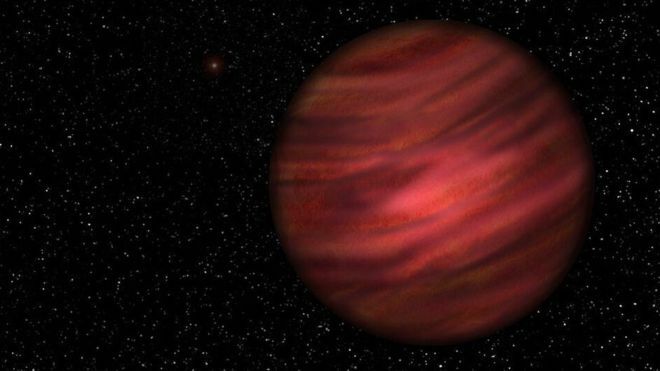 The discovery of "The Largest Solar System Ever" has taken revolutionary turns in astronomy. Estimations conclude that a planet revolving around a red dwarf star takes one million years to complete its orbital motion, once only! This "planet" was thought to be the "lone wolf" floating in space. This means that it was believed that it was a free-floating body. However, research has made revelations and provided some confirmations of this planet's "long-distance" link with a red dwarf star. The planet, labelled as 2 MASS J2126-8140, was classified as a part of the Tucana Horologuin Association, which is just a fancy term for a bunch of stars and substellular bodies with an age of 140 million years. On the basis of mass and youth, this planet was thought to be the ultimate introvert of space. Alone and in a bubble of its own. It couldn't be associated to any system and is thought to have been pinched off of its parent system by confrontations due to gravity in or nearby the parent system. Hence all the dots were joined to it being a free floating daughter body wandering about in space and time. However, latest research begs to differ. It was figured that the planet was revolving around a red dwarf star all along but they were too far apart to link, both of them being 104 light years from Earth. The distance between the star and planet is 6900 times that of the Earth's and sun's. Its orbit is by far, the largest, being 1 trillion kilometers (621 billion miles) and 140 times wider than Pluto. From afar, red dwarf star (TYC 9486-928-1) produces an imagery of a plain, simple and not-so-bright star in the sky. Dr. Simon Murphy of Australian National University, an integral researcher of this study, concluded that the pair was formed 10-45 million years ago from a filament of gas that pushed them together in one direction. Its mass is estimated to be between 11.6 - 15 times that of Jupiter's. An obvious fact as it is, this planet is no place for living organisms to strive, revive or survive. Meaning, No traces of life can be found on this lonely planet. It may generate warmth, adequate to heat up any moons, if it is constituted at the farther end of the deuterium burning line (which are nuclear fusion reactions). But ultimately, even all the heat produced as a result of fusion can't metaphorically, lend a hand, in overcoming the cold and void of space and so this lifeless planet will remain in the depths of dark and cold, forever.